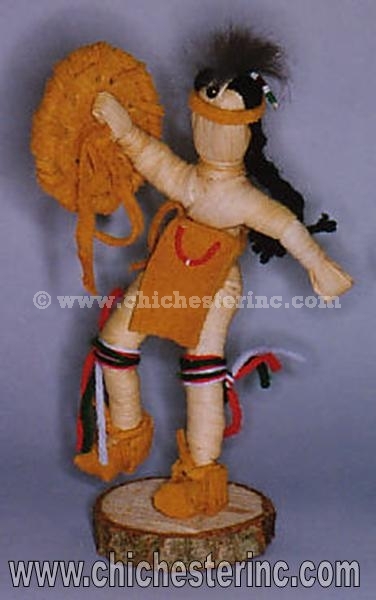 Iroquois Corn Husk Doll, "The Buffalo Dancer"
These dolls are handmade by Native Americans in Canada. Most are made with corn husks and decorated with cloth, deerskin leather, beads, etc. We offer several styles. The pictures below are for reference only. For more information, see below. The Buffalo Dancer doll is 6" high. These dolls are made by Iroquois artists on the Six Nations Reservation in Ontario, Canada. They are trimmed with deerskin. Genus and species: Odocoileus virginianus. See the doll against a square mat for a size comparison. See the doll from behind. The Shield Dancer doll is 6" high. These dolls are made by Iroquois artists on the Six Nations Reservation in Ontario, Canada. They are trimmed with deerskin. 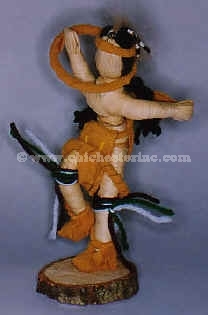 The Hoop Dancer doll is 6" high. These dolls are made by Iroquois artists on the Six Nations Reservation in Ontario, Canada. They are trimmed with deerskin. The Cayuga Singer doll is 6.75" high and measure 5" from arm to arm. These dolls are made by Iroquois artists on the Six Nations Reservation in Ontario, Canada. They are trimmed with deerskin. The Hunter doll is 7.25" high and measure 3" from arm to arm. These dolls are made by Iroquois artists on the Six Nations Reservation in Ontario, Canada. They are trimmed with deerskin.